This poorly known North American taxon was originally erected for Geranoides jepseni Wetmore, 1933, a species represented by a distal tibiotarsus and an associated incomplete, long and slender tarsometatarsus from the early Eocene Willwood Formation of Wyoming (Wetmore 1933a). Cracraft (1969, 1973a) included six further species in the Geranoididae, which are also based on hind-limb elements, i.e., Paragrus prentici (Loomis, 1906) (distal tibiotarsus, distal femur, pedal phalanges), P. shufeldti Cracraft, 1969 (distal ends of tibiotarsus and tarsometatarsus), Eogeranoides campivagus Cracraft, 1969 (distal tibiotarsus and proximal tarsometatarsus), Palaeophasianus meleagroides Shufeldt, 1913 (distal tibiotarsus, incomplete femur and tarsometatarsus), P. incompletus Cracraft, 1969 (fragmentary distal tarsometatarsus), and Geranodornis aenigma Cracraft, 1969 (distal tibiotarsus). Except for G. aenigma, which stems from the middle Eocene Bridger Formation, all of these species come from the Willwood Formation. Remains of P. meleagroides were found in both the Willwood Formation and the Bridger Formation. The species included in the Geranoididae are large, crane-sized birds. An assessment of their phylogenetic affinities is hampered by the fact that they are only known from fragmentary hindlimb bones (more complete specimens were mentioned by Olson 1985 on p. 159, but still remain undescribed). Neither has the validity of all of the above-mentioned taxa been convincingly established, nor a clade including all of them. 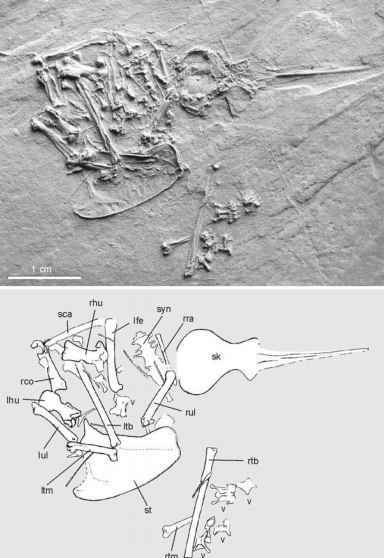 As also noted by Cracraft (1969), the bones of the well-represented taxa most closely resemble those of the late Eocene and Oligocene Eogruidae of Central Asia (Sect. 9.3.3). Cracraft (1973a), however, considered the Geranoididae to be most closely related to the Bathornithidae and Idiornithidae, i.e., to taxa of the Cariamae (Chap. 13). I agree with Olson (1985) that Cracraft's earlier hypothesis is probably the correct one, and that the Geranoididae are most closely related to the Eogruidae. As in the latter and extant Gruoidea, but in contrast to that of the taxa of the Cariamae, the distal tibiotarsus of the Geranoididae exhibits a prominent tubercle lateral of the supratendinal bridge. Also as in the Eogruidae, the hypotarsus encloses a bony canal, presumably for the tendon of the flexor digi-torum longus muscle, whereas the hypotarsus of most Cariamae is simple and block-like (some taxa in the Bathornithidae are exceptions). Future studies will have to concentrate on the identification of other bones of the Geranoididae among the specimens from the Willwood Formation and the Bridger Formation. For example, it is possible that a large coracoid and associated bone fragments (including a fragmentary tarsometatarsus) from the Willwood Formation, which were described as Calcardea junnei by Gingerich (1987), belong to one of the above-mentioned taxa. Gingerich (1987) considered C. junnei to be a member of the Ardeidae. This identification is not supported by the morphology of the specimen, which among others exhibits a foramen for the supracoracoideus nerve, a feature invariably absent in the Ardeidae.